Exemptions: Pursuant to Title 43 CFR 9212.2, the following persons are exempt from this order. Persons with a permit from or contract with the BLM that specifically authorizes the otherwise prohibited act. 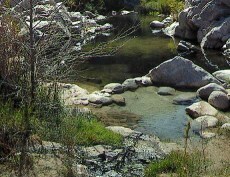 Persons using the Whitewater Canyon Road as a means of accessing the Whitewater Preserve operated by the Wildlands Conservancy. Owners or lessees of land in the area for the purpose of accessing that land. Residents in the area for the purpose of accessing their residence. Persons engaged in a business, trade, or occupation in the area requiring passage through or upon BLM land in order to conduct such business, trade or occupation. Any other person meeting exemption or requirements specified in the order. Persons with a permit specifically authorizing the otherwise prohibited act. Hikers utilizing the Pacific Crest Trail (PCT) and specified connector trails when in compliance with all other applicable fire restrictions and orders. The area, roads, and trails affected by this order are a combination of BLM public lands, private lands and conservancy lands within the boundaries of the Palm Springs-South Coast Field Office, Bureau of Land Management. For information call (760) 833-7100.